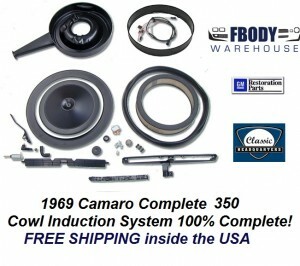 Complete Camaro 350 Cowl Induction System. Includes all our individually available superior quality parts: Faithfull reproduction air cleaner body with four barrel carb base (Rochester/Holley), attached breather tube (1" hose), stainless spark arrestor, high pleat count performance air filter, original gauge gloss black lid, 350 extension ring, cowl seal flange, flange to hood seal, flapper valve seal, flapper valve, valve retainers, flapper frame and seal, OE quality licensed solenoid (with part number) and firewall relay, concours quality FACTORY-FIT(c) wiring harness, hood grommet, cowl inductionn throttle arm with hardware, switch and retainer, correct small block valve cover elbow and grommet. All hardware and installation instructions included. Original high gloss coated black finish. 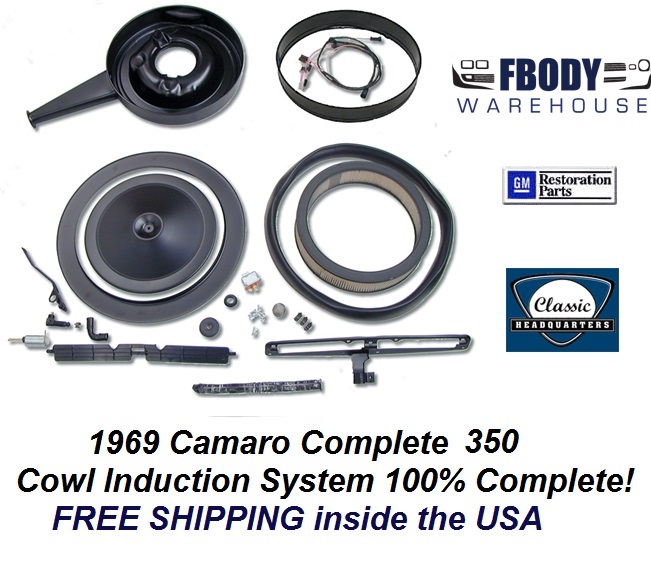 Complete 1969 Camaro 396 Cowl Induction System. This is complete and simply put out of the box and onto the car, DONE. Correct big block valve cover elbow and grommet. 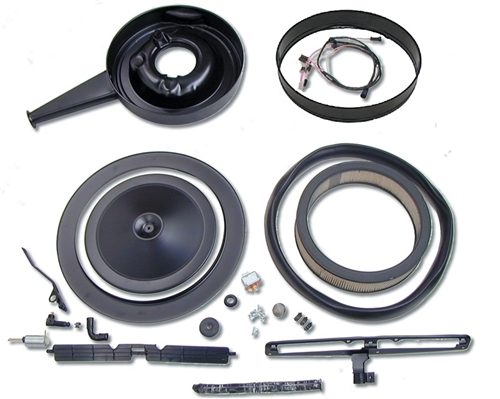 Original high gloss coated black finish. Use the drop down to select shipping location.